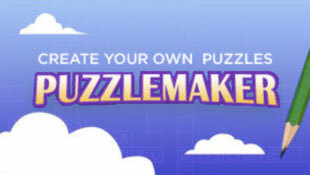 If you're looking for games, such as word searches, math squares, mazes, cryptograms, hidden messages and more, then take a look at Puzzle Maker, a part of Discovery Education. Some things are free, but you can get more by purchasing the Puzzle Maker CD-ROM. However, you don't need to purchase it to use the free material they have on their site. So whether you're looking for a filler, a warmer, or a cool down, try using one of their puzzles in your class today.